Students reflected on how to improve each campus community through engaged student leadership. On a beautiful May weekend, 30 students of the Webster LEADS leadership program from Webster University's Geneva, Leiden and Vienna campuses met up for what has become a hallowed annual tradition - the joint European leadership retreat. This year, a stunning new location was selected -- a 16th-century villa perched amongst the Tuscan hills just outside of Pistoia, near Florence. Webster Geneva professor and head of the Photography Department Francesco Arese Visconti hails from the region and has based his photography workshop - Photography in Tuscany (PHOT 4000), at this location since 2007, and with his help the LEADS students were able to join their photographer colleagues for an extended weekend. The full program included icebreakers, team-building and skills building activities (role-play, orienteering, vision boards), art project, reflection time and planning for how to improve each campus community through engaged student leadership, not to mention lots of laughs and new friendships. 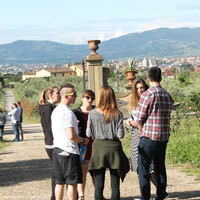 The retreat also included a half-day walking tour of Renaissance city of Florence, considered one of Italy’s most beautiful cities and art capital of the world. Activities were led by Student Affairs staff and senior student leaders, and left a positive impression. 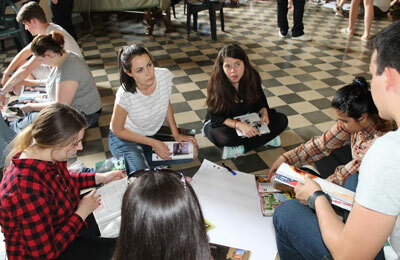 Leiden participant Stefania Lessen was hopeful the retreat would lead to big things. “It was nice to meet other students like us and make new friends and hopefully we can build better relationships with the other campuses,” she said. 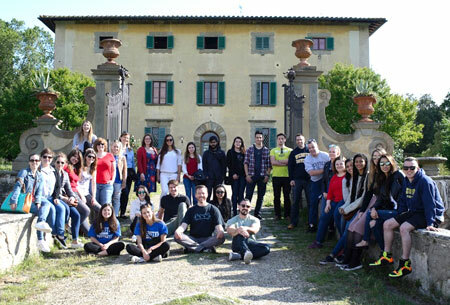 And Geneva’s first-year student Etsehiwot Negash shared on social media: “I got the amazing opportunity to travel to three Italian cities - Pistoia, Pisa and Florence - for the Webster LEADS retreat with some of the coolest people I have ever met. Every minute was a blast. This was such an amazing way to begin the summer! Feel so proud to be a leader and part of the Webster community!" The participation of the Vienna campus was partially sponsored by Star Immobilientreuhand, which represents the first corporate sponsorship of the LEADS program. See more photos from the weekend in the Webster Geneva Facebook album and the Webster Vienna album.